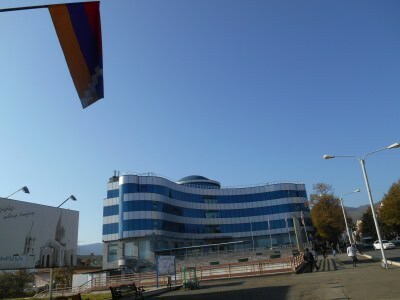 The Ministry of Foreign Affairs in Stepanakert, Nagorno Karabakh. I write this blog post live from the Republic of Nagorno Karabakh. Nagorno Karabakh is a country which is basically recognised by no-one but itself, and Armenia. As far as backpacking goes, you will need to get a visa to visit Nagorno Karabakh. It is classed separately to Armenia, and the country itself sits on land claimed by Azerbaijan. History lessons can wait, as a tourist you just want your visa sorted. 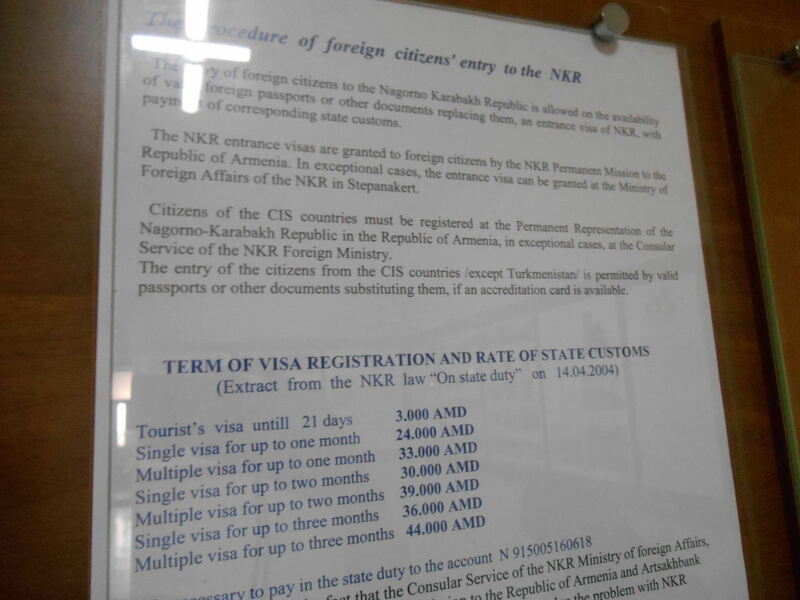 Here’s a guide on how to get a Nagorno Karabakh Visa in Stepanakert. On Don’t Stop Living I will be referring to the country as Nagorno Karabakh, but the locals know it as Artsakh, and both names will appear on your visa. Azerbaijan obviously don’t recognise the legitimacy of it as a country. Nagorno Karabakh sits like a blob in the middle of Azerbaijan land (not in the middle exactly, to the west and near the Armenia border). It’s a country within a country, in a similar way to how landlocked Lesotho and San Marino sit within South Africa and Italy respectively. It’s a self governed and recognised separate republic with its own parliament, flag, symbols and ways of life. It’s a self governed republic. The people that live there are Armenian, but it’s argued they occupy land owned by Azerbaijan. It’s somewhat of an enigma, and a travel gem if truth be told. This is what the term “off the beaten track” was invented for. Not many tourists go here. Nagorno Karabakh celebrated it’s 25 year Republic Anniversary in 2013 – dating back to 1988, before the fall of communism. The early years of the republic had widespread violence and war. At the time the people were mostly Armenian (over 70%) and Azerbaijan wanted the land and didn’t recongise it as a republic. Sadly this led to a war, a lot of bloodshed and well, from 1994 there’s been a ceasefire line and a huge military presence in this mini republic. The capital city is Stepanakert and the country houses 150,000 people. The border to Azerbaijan is understandably closed and at the time of writing, the international airport in Nagorno Karabakh, Mayraberd remains closed due to the risk of attack. This means your only route is through the mountains of Armenia, on roads that are apparently in Azerbaijan and that lead into Nagorno Karabakh. 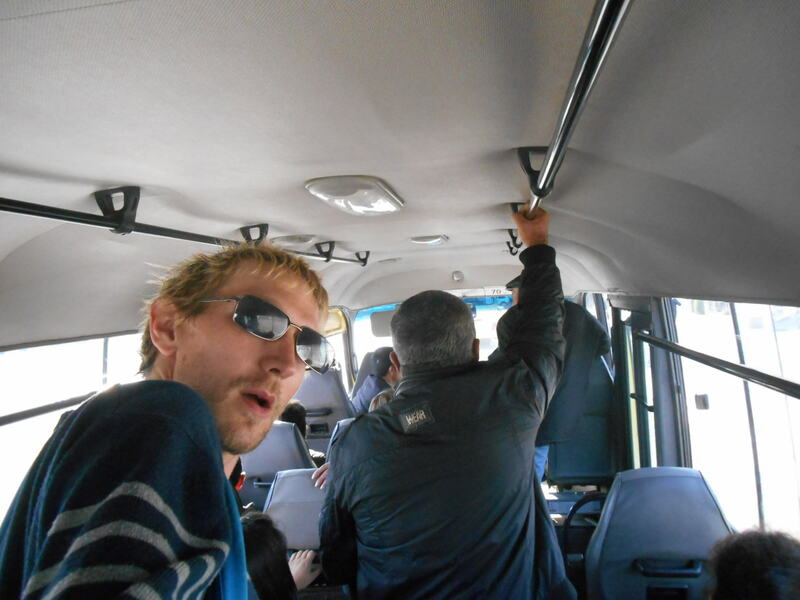 You will most likely arrive by bus or car, on the road from Goris to Berdazor. 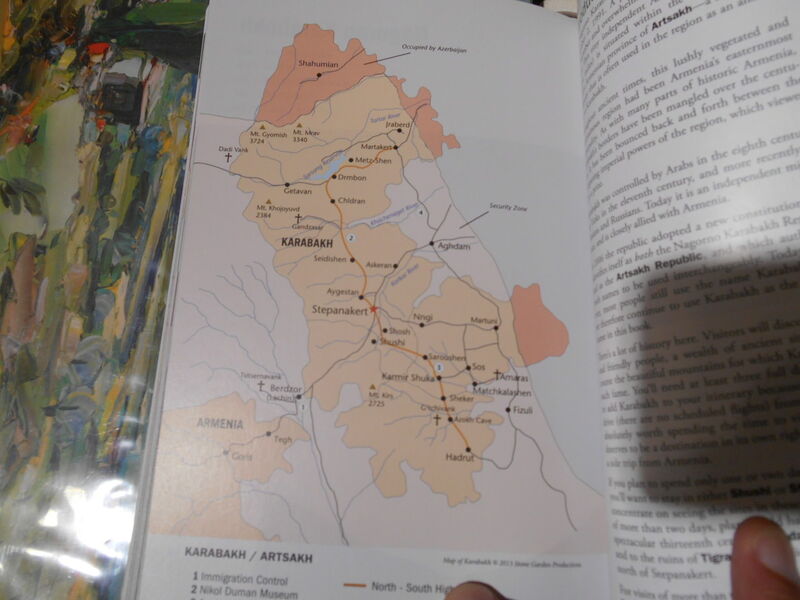 I’ve covered that separately on my world borders series: how to get to Nagorno Karabakh. Where can you get a Nagorno Karabakh Visa? 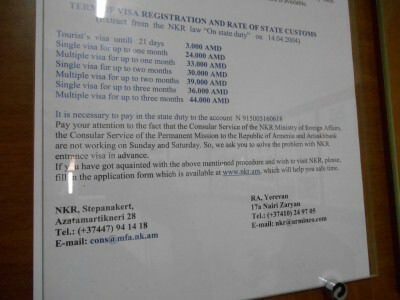 If you choose option 1 and get your visa in advance, you might still need to call into the Ministry of Foreign Affairs on arrival in Stepanakert anyway to register it and get your registration card. If you choose option 2, you’ll also still have to do this and you will hold your driver or the bus up at the border. So just wait until you are in Stepanakert and get your visa sorted there. 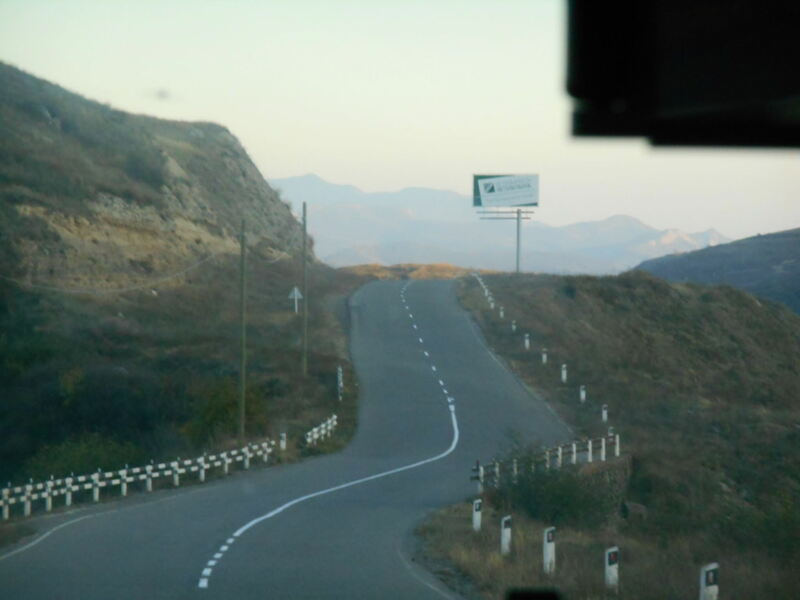 On a local bus in Stepanakert, Nagorno Karabakh. Backpacking in a place where nobody goes backpacking! What Happens on Arrival at the Nagorno Karabakh border if you don’t have a visa? 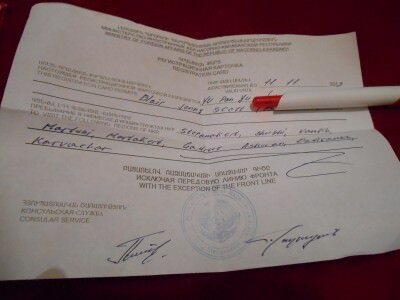 This is the piece of paper you will be given on arrival in Nagorno Karabakh. 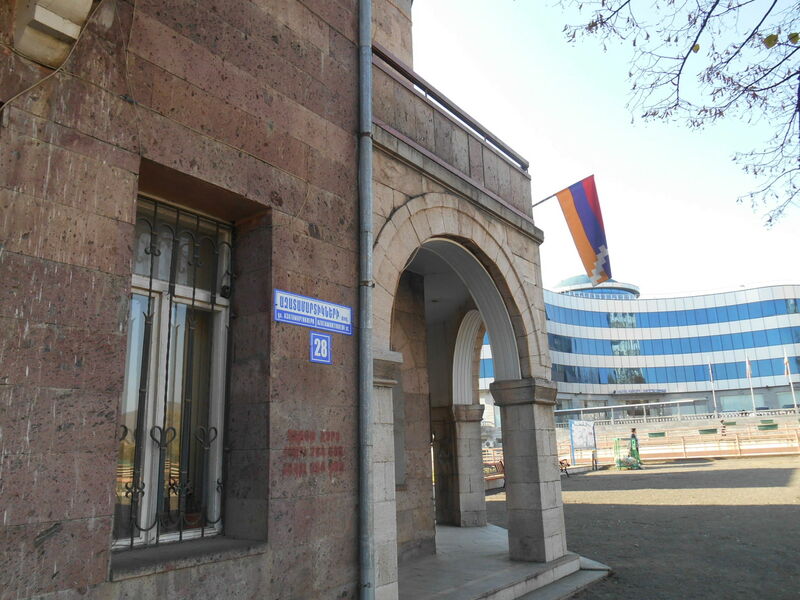 When can you get your Nagorno Karabakh visa in Stepanakert? 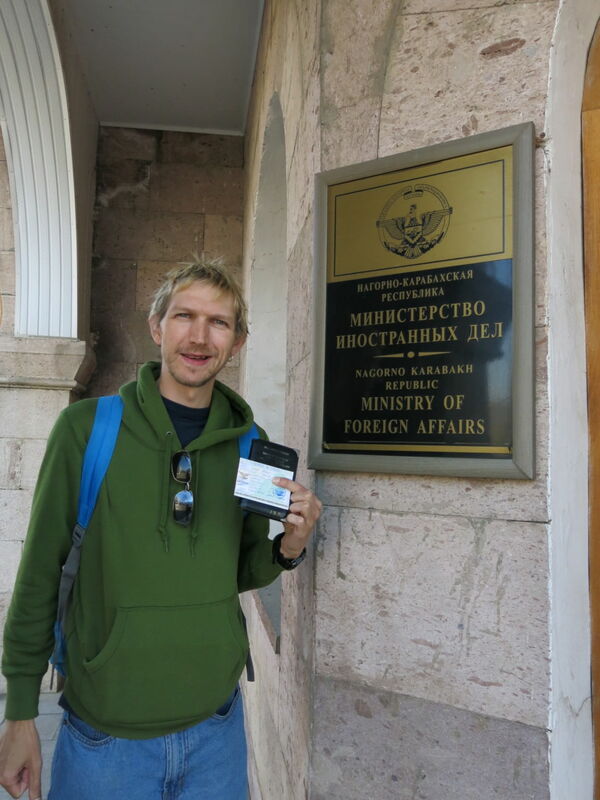 OK so the Ministry of Foreign Affairs in central Stepanakert is where you need to go. It will be open “normal working hours”, i.e. Monday to Friday 9am – 5pm. We arrived after 6pm, so had to wait until the next morning. This is perefectly fine and a lot of people also do this. As long as you get it within 24 hours of your arrival in the country. 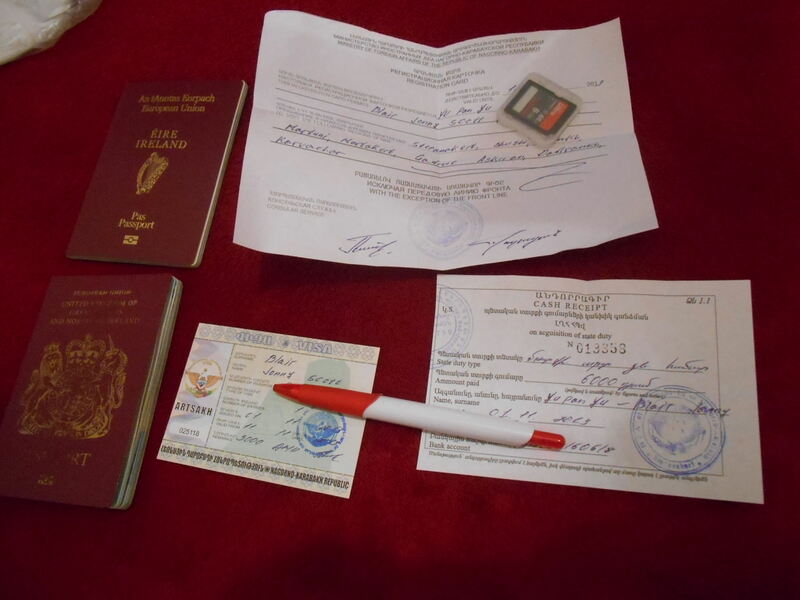 Success – My passport and my visa for Nagorno Karabakh! 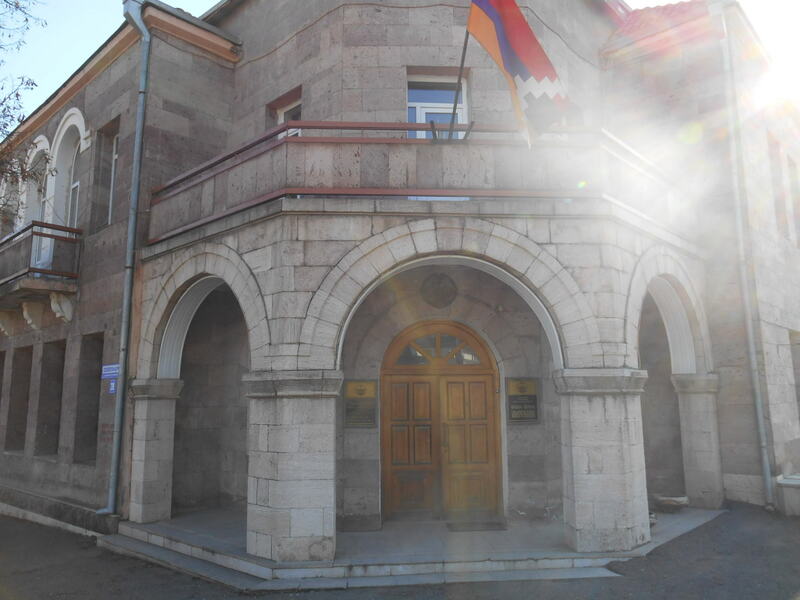 Where can you get your Nagorno Karabakh Visa in Stepanakert? 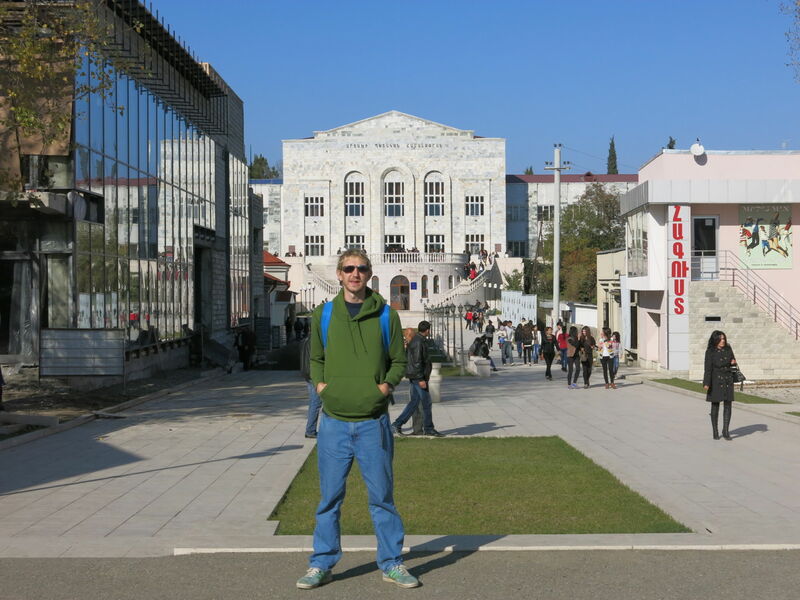 Head to the Ministry of Foreign Affairs on the main street in downtown Stepanakert. It’s a quiet capital city and finding your way around shouldn’t be too tricky. Head to Azatamartikneri Street which leads from Victory Square down to Shahumian Hraparak, a National Roundabout near the President’s Building. The Ministry of Foreign Affairs of the Nagorno-Karabakh Republic, Consular Office Stepanakert, 28 Azatamartikneri Street, Stepanakert, Nagorno Karabakh. The building is easy to spot, it sits on the other side of the road from the Bus Station, and just down from the Hotel Europe. The Hotel Europe sits beside the Ministry of Foreign Affairs in Stepanakert, Nagorno Karabakh. 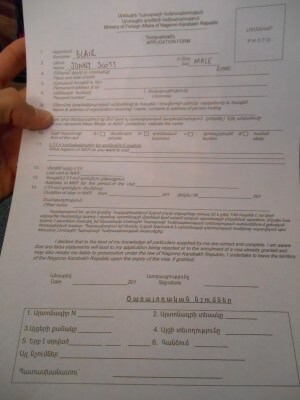 Filling in my visa form for Nagorno Karabakh in Stepanakert, at the Ministry of Foreign Affairs. The Visa form for Nagorno Karabakh. Do not mention that you will visit Agdam or any of the cities/towns near the front line. These parts are off limits to travellers. If you want to go to these places (like I did), just don’t tell them, do it quietly. On places we are visiting I wrote, Shushi, Stepanakert, Gandzasar and Vank. Do not say anything about Azerbaijan. You can still get the visa with an Azerbaijan visa in your passport, but it’s best not to mention it. Don’t make stuff up. It’s still a country with a huge military presence so you want to stay on the right side of them – they are nice people. 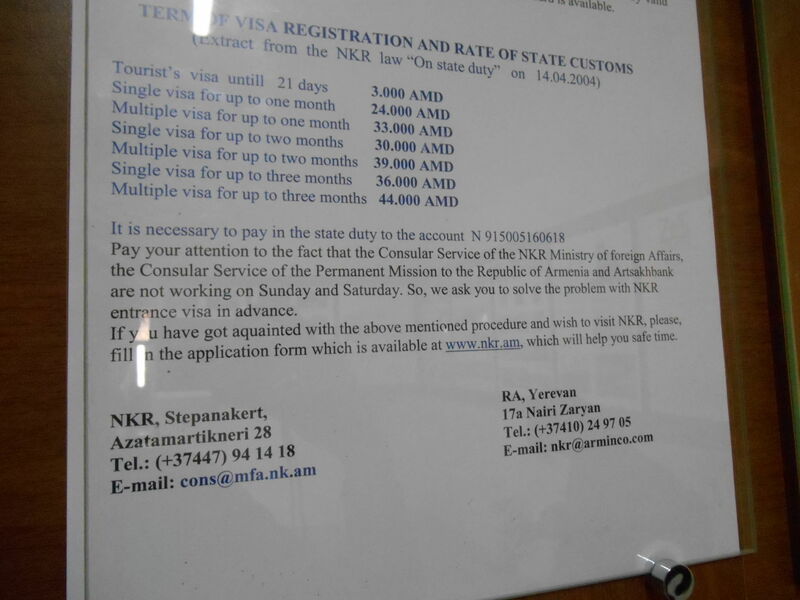 How much does a Nagorno Karabakh Visa cost? 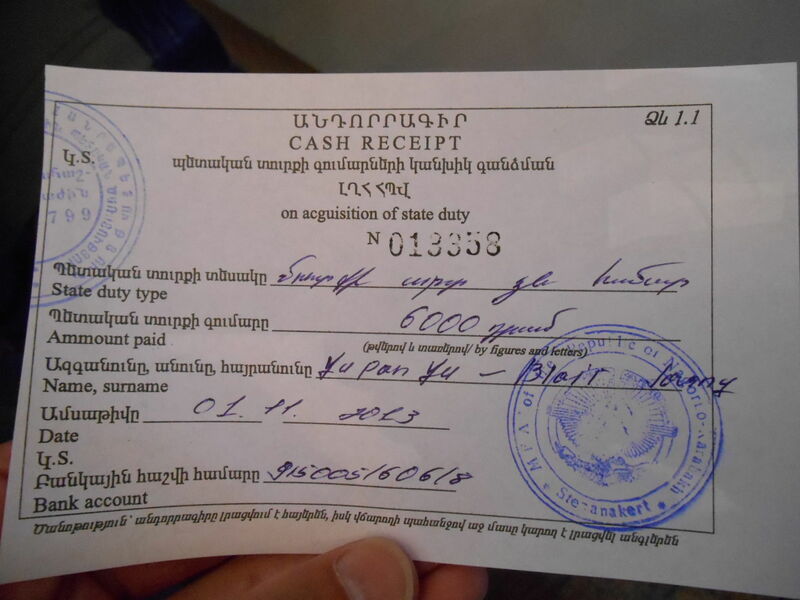 For a 21 day tourist visa, it’s 3,000 Armenian Dram. It is payable only in cash on arrival at the Ministry of Foreign Affairs. Other currencies are simply not acceptable – there are a few money changers in the city centre if you get stuck. 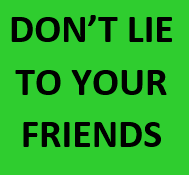 Also try to have exact change for them – they don’t really have change. 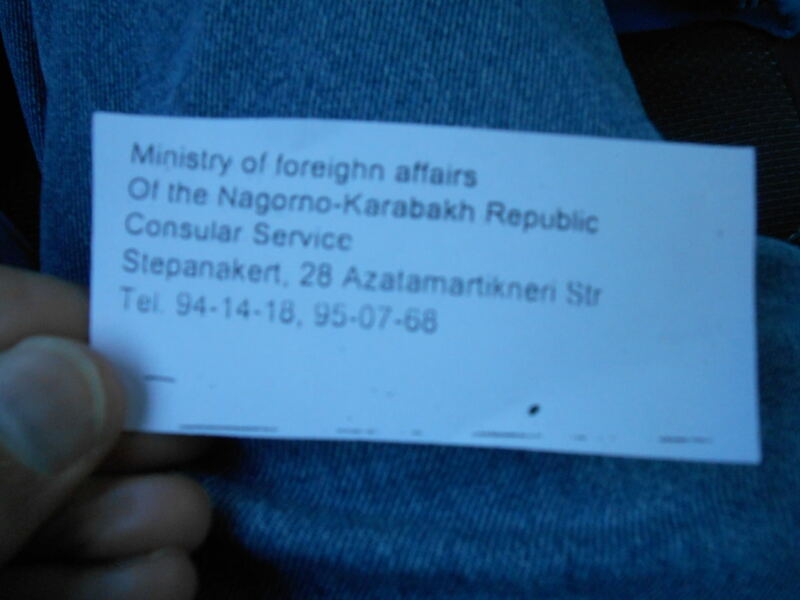 Information about the Nagorno Karabakh Visa application in the Ministry of Foreign Affairs, Stepanakert. What will you get once you’ve done the application? You can get the visa inside or outside your passport, make your mind up depending on whether or not you want to use the same passport to later enter Azerbaijan. 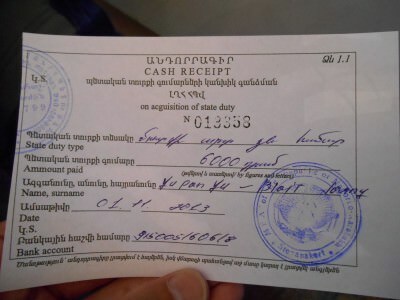 The cash receipt that proves you have paid for your visa for Nagorno Karabakh. 3. 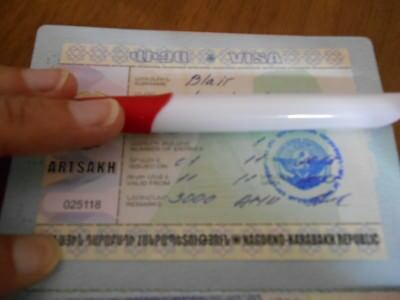 A registration card which confirms you got the visa and have the right to visit certain parts of the country, with the exception of the Front Line. You’ll need one of these permits too – basically it will tell you where you can and cannot go withing the Nagorno Karabakh Republic, also known as Artsakh. Do I have to get the Nagorno-Karabakh Visa in my passport? Absolutely not, in a similar way to Jordan/ Israel you can ask for the visa on a sticker instead. This means you won’t have any entry or exit stamp for Nagorno Karabakh in your passport, nor a visa. When someone looks at it, they won’t know you’ve been there at all. 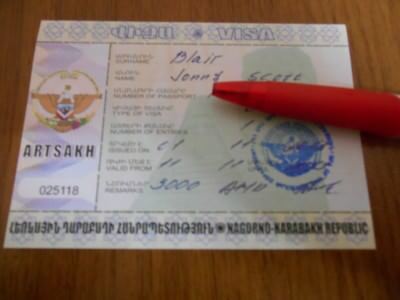 Can you get into Azerbaijan with a Nagorno-Karabakh Visa in your passport? 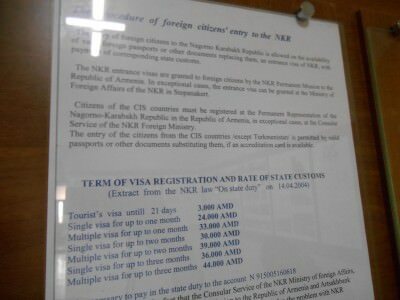 All you need to get a Nagorno Karabakh Visa in Stepanakert at the Ministry of Foreign Affairs. Can the Nagorno Karabakh Visa be extended? 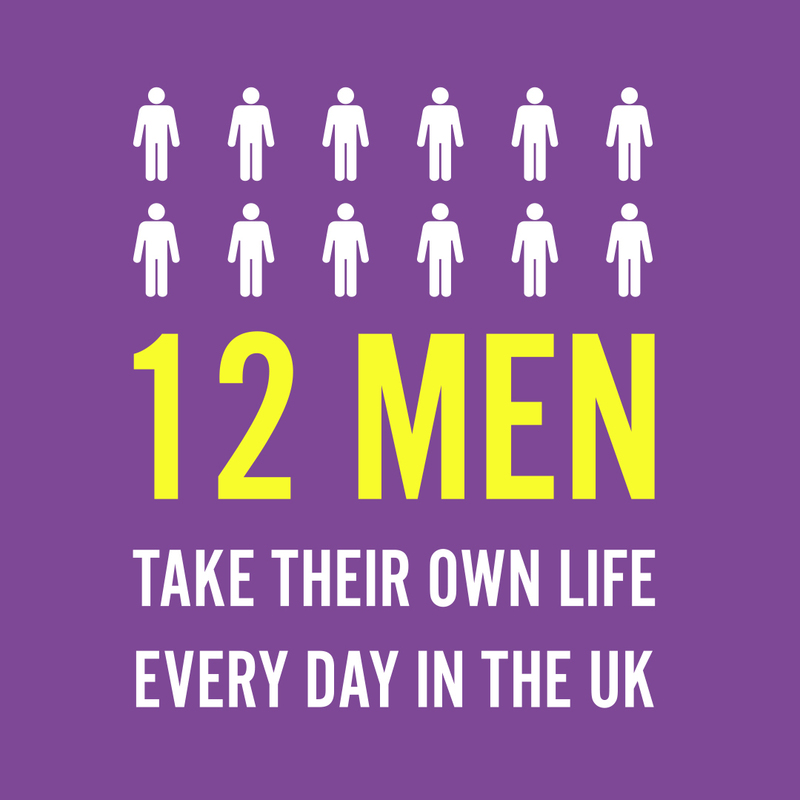 Yes, but in all honesty the 21 days they give you should be easily enough to see the country. Most tourists come and go in less than a week – we did 4 days there. To extend it, just pop back to the Ministry of Foreign Affairs and pay a fee to get it extended. 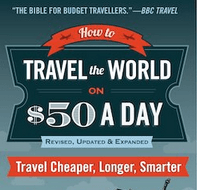 Incidentally longer visas can simply just be issued at the start to save the hassle. The photo below explains the different prices. The longer the stay, the more you pay, obviously. 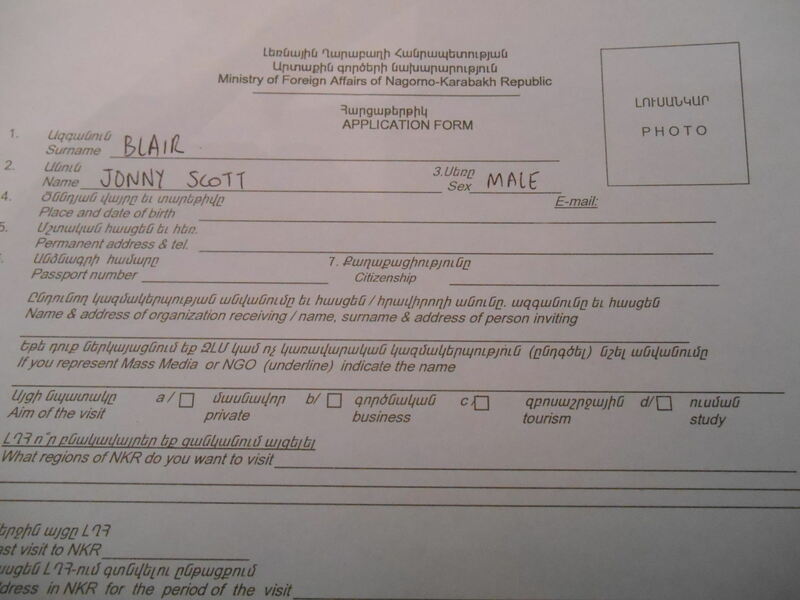 What limits does the Nagorno Karabakh Visa have? OK you cannot legally visit Agdam and any village or town on the front line. Of course, you could go to these places, but it’s officially not allowed, so tread carefully. I did visit the Front Line at Agdam as I was interested in seeing it. But it’s up to you if you want to risk it or not. Most tourists just stick to the sightseeing stuff. Success! 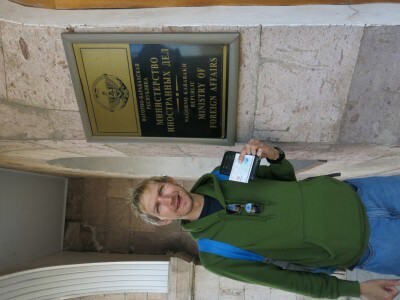 Outside the Ministry of Foreign Affairs with my Nagorno Karabakh Visa!! Thanks to the assholes at Apple the photo is on its side!! 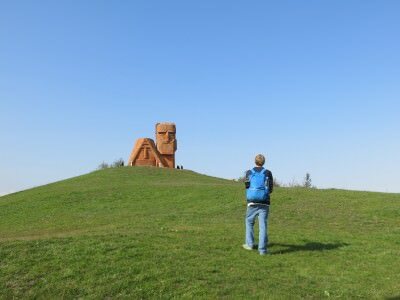 What are the top sights of Nagorno Karabakh? I’ll be writing a load more about this, but Vank, Shushi, Stepanakert, Azokh, Tigranakert, Dadivank and Gandzasar are the most popular sights. Agdam and Varanda and all Front Line/ Border villages are off limits, though I did manage to visit Agdam. 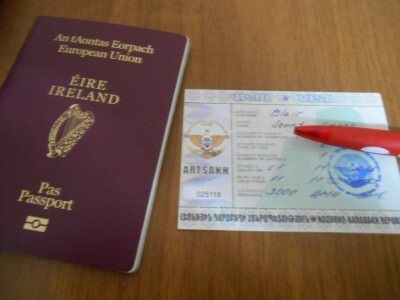 This entry was posted in Central Asia/Middle East, Destinations, Nagorno Karabakh, Stepanakert, Visas. Bookmark the permalink. the Nigeria citizen get visa Tourist Visa NAGORNO -KARABAKH REPUBLIC because your NAGORNO -KARABAKH embassy is not our country Nigeria . Hi Jonny, thanks so much for sharing. How come the visa fee is written as 3000 on the visa but 6000 on the cash receipt? 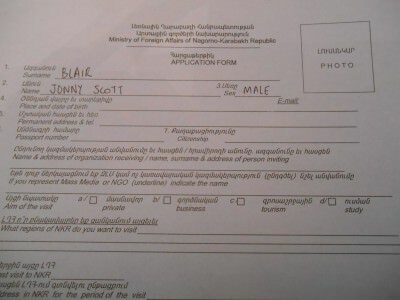 Hi Jonny, I know you wrote the post a while ago, but I just found it as I’m planning my trip to Nagorno Karabakh as well. Do you know, is there any chance to be able to enter Karabakh on the weekend? You mentioned that even getting VOA, it might still be necessary to contact the officials. Is it also only doable Mon-Fri or is there a visa option to enter on Friday night/Sat morning and stay for 3-4 days? I understand to get a visa on Mon would be too late then? Thanks for this Johnny. This is exactly what I needed to know especially that they allow you to take a sticker as likely want to visit Azerbaijan after.